Direct flights between Russia and China are set to surge, thanks to a considerable increase in the number of Chinese tourists making outbound trips, said a senior official of Moscow Sheremetyevo Airport. Alexander Nikonov, head of the foreign airlines division, aviation marketing and commerce department of the airport, said his airport and Chinese airlines have been working closely to increase passenger traffic between China and Russia in the past decade. Sheremetyevo Airport, the largest in Russia, held an exhibition recently to celebrate the 10th anniversary of the direct flight between Beijing and Moscow by Hainan Airlines. Nikonov said now there are eight Chinese airlines operating between Russia and China, four of which belong to HNA Group, the parent company of Hainan Airlines. Zhang Tie, general manager of Hainan Airlines Moscow office, said this year marks the 10th anniversary and a milestone as well for the airline into the Russian market. "Exploring the new market here was quite difficult for us 10 years ago, as the flights between China and Russia used to serve only businesspeople. But with the opening of the Russian tourism market and strengthening Sino-Russian ties, most of our passengers are tourists from both countries," Zhang said. The flight frequency between the two capitals has been raised from two flights per week to one flight per day in the peak seasons, which indicates the confidence of the Chinese airline company in the Russian market and fits the expectation when they first set up the office in Russia 10 years ago, Zhang said. Currently, China and Russia are working together to coordinate the China-proposed Belt and Road Initiative and Russia's Eurasian Economic Union. Data from the World Without Borders Tourism Association of Russia shows the number of Chinese tourists has been rising by 15 percent to 20 percent every year. Last year, over 2.3 million Chinese group visitors arrived at Sheremetyevo Airport. "Visitors from China to Moscow via Sheremetyevo Airport reached a peak last year, due to the visa-free policy during the FIFA World Cup in Russia, along with the visa-free facilities for Chinese tourist groups," Nikonov said. It's worth mentioning that the Moscow-based World Without Borders Tourism Association runs a program called China Friendly, which has engaged companies in the tourism industry to provide better services to the increasing number of Chinese customers. 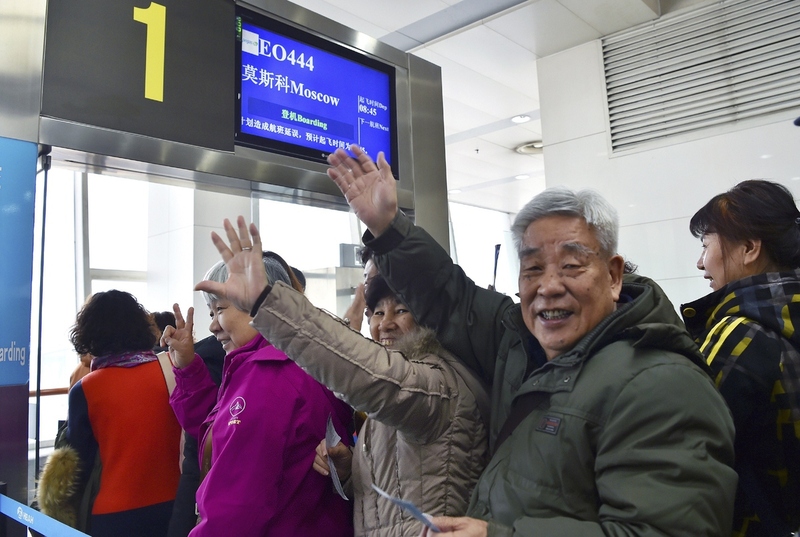 Sheremetyevo Airport officially joined the China Friendly program on March 24, showing the determination of the country to welcome more Chinese tourists. "The airport has added Mandarin to all its vocal announcements and deployed employees well-versed with Chinese culture and traditions to better serve the Chinese passengers," Nikonov said. Zhang is proud of the changes in the Russian airport. He said it's a difficult task to make a public facility change in order to adapt to the increasing number of Chinese tourists. He said Russia, as a key country involved in the Belt and Road Initiative, has always been a main target market for Chinese airline companies. Hainan Airlines started several routes to Russia from Tianjin and Chongqing. It also plans to start flights from some other cities like Kunming, Hangzhou and Qingdao.